Modifies the font, font size, and color for the selected text. Use the Font command to format only selected text. To format all tasks or resources in a particular category, such as summary tasks, critical tasks, or overallocated resources, use the Text Styles command on the Format menu. You can also use the Text Styles command to format column titles, the timescale, and bar text on the Gantt Chart. Individual text formatting overrides formatting applied using the Text Styles command. For example, if you use the Text Styles command to format all noncritical tasks as regular 8-point, you can use the Font command to format a selected noncritical task as 10-point italic. The Font command affects only the task you select. Font - Select a font. 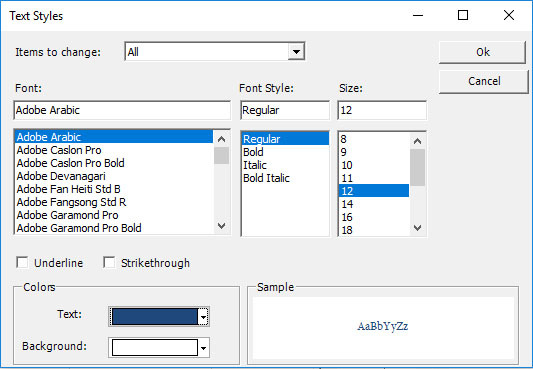 Font Style - Select a style for the font. Size - Select or type a font size. Underline - Select if you want underlined text. Color - Select a color. 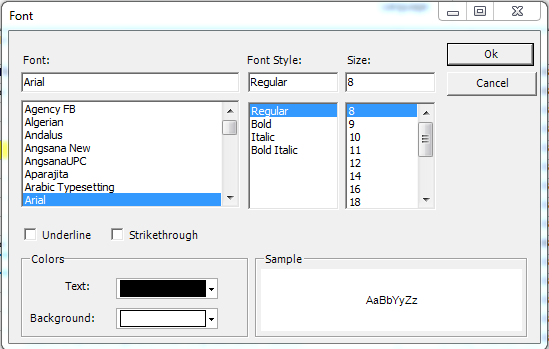 Sample - Shows the font as it will appear. Modifies the font, font size, color, and other options for groups of tasks and resources. Use the Text Styles command to format all tasks or resources in a particular category, such as summary tasks, critical tasks, or overallocated resources. You can also format column titles, timescale text, and bar text on the Gantt Chart. To format selected text only instead of all text in a category, use the Font command. Select the category of cells that you want to highlight from the Item To Change. Underline -Select if you want underlined text. Click OK to confirm the change of style to ALL summary tasks' text. Rather than use buttons in the Font group of the Task tab for changes to the current object's text, styles can be applied by task type to show emphasis.